The piquant Sichuanese specialities from Si Chuan Dou Hua will leave you dumbstruck and all hot under the collar. In her riveting food memoir, Shark’s Fin & Sichuan Pepper, renowned English food writer Fuchsia Dunlop proclaims Sichuanese cooking, with its cornucopia of bold and robust flavours, as one of the four great Chinese regional cooking styles. Fortunately, Klang Valley residents don’t need to travel far for a taste of Sichuan — a trip to the Si Chuan Dou Hua Restaurant, ParkRoyal Kuala Lumpur, will do nicely. Opened in 2003, it is the third outlet under Singapore’s Si Chuan Dou Hua chain. Helmed by chefs Wong Yunghai and Chew Chee Kuong, it serves Sichuanese and Cantonese specialties in a serene, understated ambience. Warm wood and illuminated etched glass finishing are discreetly accentuated with refined Oriental motifs. The resident tea-pouring expert is a real conversation-stopper as he skilfully fills your cup of Eight Treasures Tea using a hand-held bronze pot with a metre-long spout from two feet away! A signature brew of Si Chuan Dou Hua, this tea’s combination of jasmine, tea leaves, red dates, kei chi (Chinese wolfberries), dried longans, dried chrysanthemum, dried lily bulbs, mai dong (a Chinese herb known for its “cooling” attribute) and rock sugar is meant to help reduce bad cholesterol, improve blood circulation and strengthen the body’s immunity. After reading Dunlop’s blow-by-blow account of her Sichuanese cooking class, I now have a deeper appreciation not only for Sichuanese food but also for the complexities of Chinese cuisine in general. For instance, the Three Delicacies Combination (RM18 small, RM28 medium) is no longer just a trio of appetisers but works of art that showcase the chefs’ meticulous cutting and stir-frying techniques, judicious use of spices and condiments, and clever combination of ingredients and tastes. Braised eggplant with minced garlic. The secret to the smooth Cucumber with Dried Chilli and Sichuan peppercorns is down to hua chao, a swift stir-frying method that leaves the crunchy, finger-long chopstick strips of cucumber jade-green yet barely coated in oil, with hints of spiciness and ashy nuance from the dried chilli and Sichuan peppercorns. Refreshingly cool yet richly nutty on the palate, the Shredded Chicken with Sesame Sauce & Scallion conjures another imaginative union of textures and flavours. We find the mildly briny-spicy dressing of tau pan cheong (Sichuan chilli bean paste), ground sesame seeds and chilli oil especially addictive. A delicate serving of Button Mushrooms with thumbnail-sized slices of Ginger & Garlic with Pickled Red Chilli complete the appetising trinity. The classic Sichuanese dish of Diced Chicken with Dried Chilli & Cashew Nuts (RM25 small, RM38 medium) is not for the faint-hearted. Be prepared to get hot under the collar when you savour the dainty, tender cubes of chicken, cashew nuts, dried chilli, garlic, ginger and scallion, for hidden in their slick, darkly caramelised midst are the potent, tongue-numbing peppercorns that leaves you with a buzz. 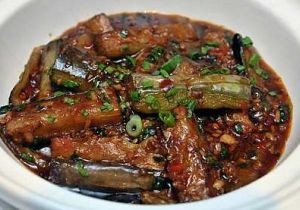 Redolent with the pungency of garlic, the Braised Eggplant with Minced Garlic in Claypot (RM22 small, RM33 medium) is another notable specialty. Buttery-soft eggplant pieces are amply covered in a tantalising sauce that’s sour, salty, sweet and spicy. Now Stir-fried French Beans with Minced Chicken (RM22 small, RM33 medium) may sound boring but trust the Sichuanese to turn a seemingly simple offering into something extraordinary. The chef uses ya cai, a dark leafy Sichuanese vegetable preserved in brine to give the dish a distinct mellow savouriness, while the finely minced chicken provides textural contrast, turning the dish into a tasty accompaniment for plain rice or porridge. 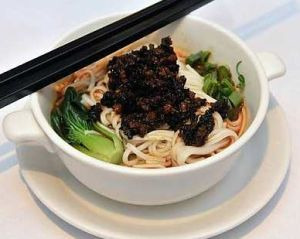 Dan dan noodle is a typical Chengdu street snack named after the bamboo shoulder pole carried by the city’s itinerant street vendors to hawk wheat-and-water noodles. Topped with minced chicken, chopped dried chilli and ya cai, the Dan Dan Noodles (RM8 per portion) here are silky smooth and laced with chilli oil, light soy sauce and sesame paste. Be sure to toss everything thoroughly to truly enjoy the hearty flavours. Sichuan is also famous for its dou hua or “flower beancurd”. You’d do well to conclude your meal with a bowl of satiny-smooth Homemade Fine Beancurd with Wolfberries (RM8 per serving). It comes with golden Chinese wolfberries-accented syrup on the side. Now you know why connoiseurs of Chinese food go to Sichuan. For reservations, please call 03-2782 8303. 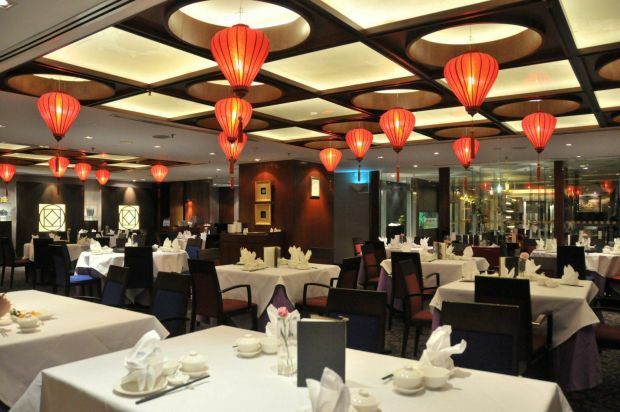 Si Chuan Dou Hua Restaurant (pork-free) is located at the Lower Lobby of ParkRoyal Kuala Lumpur, Jalan Sultan Ismail, Kuala Lumpur. All prices quoted are subject to 10% service charge and 6% government tax.